Buses, trains and taxis should be fully accessible to disabled people in 13 years' time, according to a joint committee of Parliament. 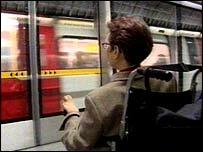 MPs and peers examining the government's proposed Disability Discrimination Bill say that a prompt and clear timetable to make all means of transport useable by people with disabilities should be announced by ministers. The recommendation has been welcomed by the body responsible for overseeing the rights of disabled people, the Disability Rights Commission (DRC). "This is great news for disabled people and, if implemented by the government, will close a major loophole in the Disability Discrimination Act," DRC chairman Bert Massie said. The DRC has also endorsed another recommendation that will improve a disabled person's right to adapt their home. "We've long argued for provision to be made in law to prevent landlords and management committees unreasonably refusing permission for disabled people to put in adaptions," Mr Massie said. The recommendation on autism has been welcomed by the National Autistic Society (NAS). "As autism is a hidden disability it is important that legislation spells out the social and communication difficulties experienced by people with these disorders," NAS spokesman Stuart Notholt said. The committee's proposals are now awaiting a formal response from the government - probably before Parliament goes into recess for the summer. A bill will then be introduced into Parliament and campaigners will be hoping that the new measures will reach the statute books before the next election as the government has already promised.